Hi. I'm sorry I am not good at English. I introduce DW WitchHunter based on lifesteal. Damage type is chaos, vitality and a bit of poison. Sigil of Consumption + Wendigo's Mark + Fang of Ch'thon provide much ADCTH, and Haunt(relic) reduces lifeleech resistance. 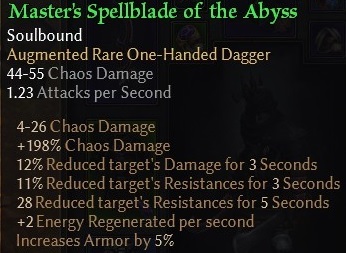 Master's Spellblade of the Abyss reduces all resistance and damage. I think this build is not as strong as tier1 build. My gearing is not best. Other affix of Cronley's Signet, Solael-Sect Legguards, Benn'Jahr's Pauldrons is better, but I do not have nice one. Looking good! Defensive setup is needed in Crucible for sure. But why the Haunt Relic? Because, I think, the Life Leech% RR does not work on ADCTH, which is your main source of gaining Health back. 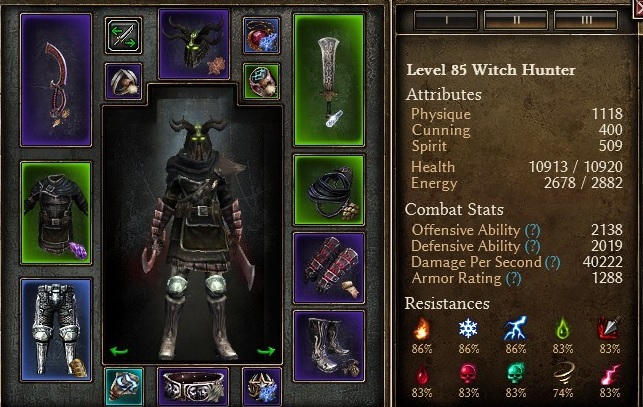 Solael's Decimation would boost your OA/Damage a lot; Necrosis is very useful too, depending on Setup. 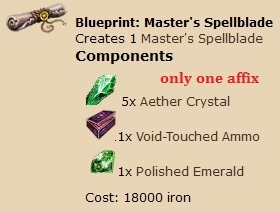 The missing gear with nice affixes and prefixes will drop sooner or later. But I dig your Gladiator build, well done! What is your AS sitting at atm? The more AS, the more ADCTH. 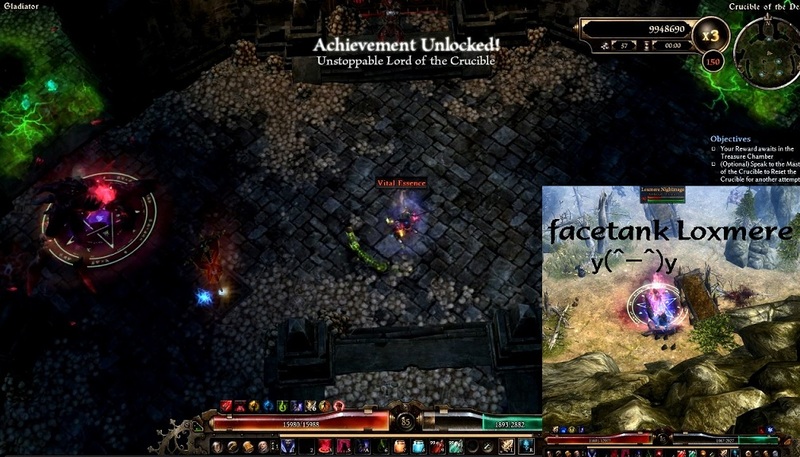 I tried Solael's Decimation and Necrosis, but lost tanky and did not clear Gladiator(main campaign is ok). Yes, I think Peerless Eye is better, but my resistance and health become low. When I get nice affix MIs, I will use Peerless Eye. Oh, nice. Learned something new today. Yes, Attack Speed. Try to farm Cronley for a while for a nice AS bonus Signet. It will boost your DPS and your survivability. Your Amulet is fine, I toyed with it for a while too. Peerless Eye grants more damage and OA, but for a defensive setup, I like your choice. True, but you'd lose a good chunk of HP and Resistances, if you can't compensate those by MI stats. And the flat Vit Damage is nice too. Nevertheless, I prefer Peerless Eye for sure. But doing Gladiator runs, I'd maybe consider Empowered Wretched Necessity for myself (or even Avenger of Cairn). Some other Amulet I might try out some day is Thread of Mortality. 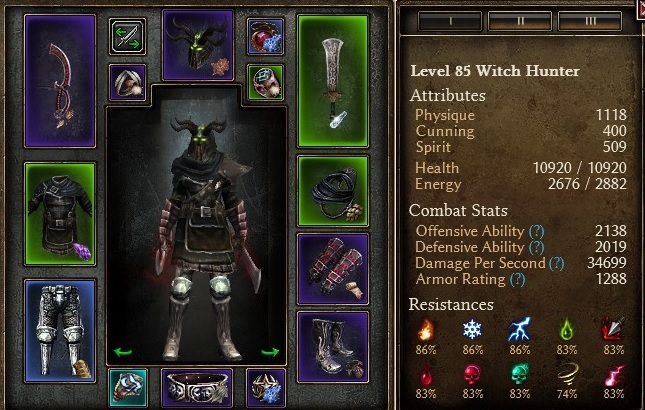 The stats sound fitting for a Chaos/Vit WH. But I'm a damage freak, so, Peerless Eye all the way. Also glad to learn it can be crucible viable, i must say i wasnt having doubts but never took the time to try so ..
Jesus, your OA is scarily low! I would seriously recommend trying to get that up for some juicer crits. I have 3300 on my dual wield wb and couldnt imagine being 1200 less. Can you put Chains of Oleron in your chest by chance without losing anything too important?